Mangaluru, Nov 20, 2018: Students and staff at the Angaragundi Government School in Baikampady had a miraculous escape on Nov 19, yesterday, Monday, after huge containers fell on the building. A private firm had stocked up the containers, which had arrived from the New Mangalore Port to the site adjacent to that of the government higher primary school many years ago. The containers had been stacked up in a precarious manner and now fell on the school building. The incident has damaged the wall of the school building. 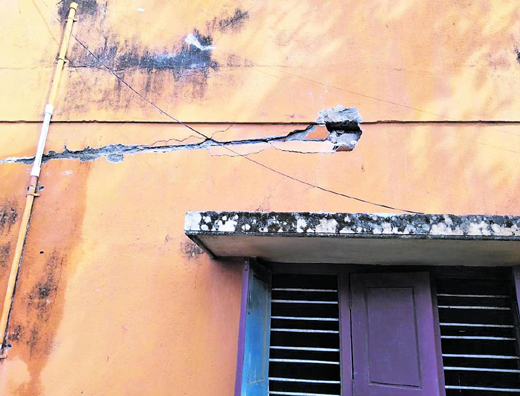 The compound wall of the school has too is badly damaged. Officials visit : Manjula, Mangaluru North block education officer, and Purushotham Chitrapura, corporator, visited the spot. They have reportedly taken the firm’s manager to task for stocking the huge containers adjacent to the school. As the news of the containers collapsing on the school spread, many parents began rushing to the school and were heard hurling abuses against the firm. The damage would have been greater had the containers collapsed during school hours, the parents pointed out. The local residents urged the authorities to suspend the permits of the firm that had stacked up the containers on the vacant land adjacent to the school.